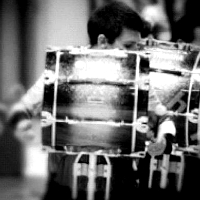 Jimmie began his drumming education in 8th grade at Fruitvale JHS, where he was a member of their first competitive drumline. He then continued on to play for the Centennial HS Percussion Ensemble from 2005-2008. After graduation, Jimmie became a charter member of the competitive Bakersfield College Drumline in 2010, was a charter member of the Pulse Percussion Open Ensemble in 2011, and marched top bass at Pulse Percussion in 2012. Aside from the performance arena, Jimmie has been teaching the Centennial HS Percussion Ensemble from 2008-present and began working at East Bakersfield HS as a marching tech in the 2012 season. He is currently the bass tech for both BC Indoor and the Golden Empire Drum & Bugle Corps.